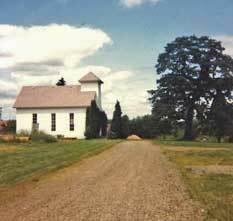 The founding of a town (1855), a university (1856), and a church (1856) fulfilled plans of pioneer Christians who traveled by covered wagon from Monmouth, Illinois, to the Willamette Valley." So reads an information sheet from the Monmouth First Christian Church. An article in the Independence Enterprise provides background about the move to Monmouth. The founding of this church was partly due to the missionary vision of Tyrus Himes of Bradford County, Pa. Mr. Himes was inspired by reports of need and opportunity presented by the traveler-missionary Samuel Parker. As a result he determined to assist in establishing a Christian school in the far west. Mr. Himes and his family started west in 1846, but he was delayed at Lafayette, Illinois, by illness until 1853. While there he talked with a number of men at Lafayette and nearby Monmouth who were, like himself, Christian Church men, and found that several of them were contemplating migration to Oregon Territory. These men were very receptive to the idea of creating a Christian institution, and made definite plans with him toward it. In 1850 several of them, including Elijah Davidson, Squire S. Whitman and Thomas Lucas, came west and took adjoining claims in Polk County. Others made the long journey in 1852 and 1853, and by 1854 had chosen the Monmouth area for settlement. The town site was surveyed in 1855, to occupy land donated entirely by Christian Church men: John E. Murphy, Elijah Davidson, John B. Smith, Thomas H. Lucas and Squire S. Whitman. The pioneers set themselves promptly to realization of their original goal. Consequently on Jan. 18, 1856 the territorial legislature granted a charter to the projected Monmouth University. That summer a twenty by thirty foot one-room school building was constructed in the block set aside for a public square . . ."
From 1856 to 1858 the young church met in the new one-room school building after which a college building was constructed on the campus and used for services. An 1875 report states, "Have no church property. Meet in College Chapel." But in 1878 the congregation built the first church building in town, locating it on the college campus at the corner of Monmouth Avenue and Church Street. It was then moved in 1893 and extensively remodeled about 1913-14. An initial group of 35 met to sign the roster subscribing to the statement, "The Bible alone is the only infallible rule of faith and practice." Among those earliest disciples were Squire S. Whitman, Elijah B. Davidson, and John Burris Smith. Leader of the church at the beginning was John Ecles Murphy (1806- ), also a charter member. Our photo has suffered the ravages of time, as it is a copy of one made prior to 1876 when John Murphy died. John and Frances had come from Warren, Ohio in August of 1852. There is a profile of John Burris Smith. There is a profile of John E. Murphy. Pioneer members included: Elijah Davidson, Margaret Davidson, Thomas H. Lucas, James L. Cooper, John E. Murphy, Frances W. Murphy, James T. Murphy, Nancy A. Murphy, Martha Haley, John C. Harris, Cinderella Smith Harris, John A. Kramer, Mary A. Kramer, Amanda Doughty, George M. Kramer, Lewis P. Kramer, E. Allen Shirley, Mary T. Shirley, William Murphy, Elizabeth Murphy, Melissa Jane Smith, Rachael Butler, Mary E. Haley, Albert W. Lucas, Elizabeth F. Lucas, Squire S. Whitman, Elizabeth Whitman, William Mason, Margaret Mason, Calvin S. Murphy, John B. Murphy, Mary A. Murphy and Margaret E. Murphy. By 1858 the congregation had grown to 111 and at a cost of $5,000 they built a two-story structure to serve both the Church and the Christian College. A simple building was then constructed on the campus where Todd Hall is located today. The church's 1881 report list a membership of 163 with F. S. Powell, W. E. Pedigo and A. W. Lucas as elders. In 1882 the college was given to the State of Oregon and is now Western Oregon University. In an article printed in the Christian Standard of 1885, David T. Stanley reported that P. R. Burnett is the "first regular pastor the church ever had." It was always the intent of Peter Burnett to "live of the gospel." In this era of one-year contracts, Mr. Burnett saved enough so when he was not under contract, he could live and preach in small churches that did not have preachers. 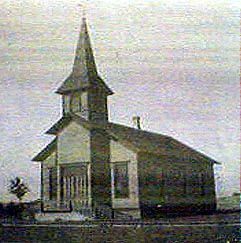 The move of the Church and its building from state property occurred about 1893. Pictured left is Alby Esson, minister from 1897-1901. Mr. Esson, a graduate of College of the Bible in Lexington, Kentucky, also ministered in Portland briefly before accepting an assignment with the Oregon Christian Missionary Convention in 1902. The First Christian Church in Monmouth is very active today. For details about its activities call the church office at (503) 838-1145. Pioneer Reminder: Church Street was named for the Disciples church building that once stood on it. Whitman Street was named for Squire Whitman, a founding pioneer. Davidson Road was named for pioneer Hezekiah Davidson and Davidson Bridge was named for Carter T. Davidson. Among the verdant, garden-like areas of the Willamette Valley, Salt Creek ranks very high. The area is worth driving through for its spectacular beauty. At one time, salt licks were found on the banks of the creek, hence the name. James B. Riggs, mentioned below, was the first postmaster. A number of Christian coming overland came first to Salt Creek before settling elsewhere. 1858 is the first year of record for the church, yet certainly saints were meeting for worship much earlier. That year they reported 39 members. One record says, "Mrs. (Jane) Baxter was baptized in Salt Creek near the old Salt Creek School where church services were held." G. W. Richardson preached there once each month in 1858. Pioneer members included Benjamin and Elvira McBride Butler (1850, 1846), James G. and Elizabeth Campbell (1853), Drury and Frances Davis (1860s), John and Sarah Frazer (1852, 1853), James B. and Nancy Riggs (1845), and Fredrick and Ann Shoemaker (1852). The entire listing of those buried in the Salt Creek Cemetery has been made available on-line by the Polk County Historical Society. The congregation was still in existence in 1888 because R. M. Messick reported to the Christian Standard of that year that he just closed a gospel meeting there and "eight were added by obedience." The Yearbook of the Disciples reports 38 members that year. Christians from the Salt Creek congregation were among the earliest members of the Dallas Church, a few miles east. The Salt Creek church no longer exists. Eugene Hayter provided this reconstructed list of charter members with notations. We include his notes that relate to the character of these fine people and have added the name of wives where that was available: Isaac M. Butler�so clean in character and intelligence, that he could not have been other than Christian; Edward Clark � faithful; Drury and Frances Davis � quiet people, and consistent members; David Cosper and wife - active in the work of the church to their last days; both lived to old age; Newman Garwood - I have never known a more reliable man . . . truly Christian, and called to many positions of public trust; Sarah Hughes Riggs - we all knew Pink Riggs, and loved her; Thomas J. and Mary Elizabeth Lovelady � they were grand, Christian people; Margaret Lovelady � a mighty, mighty, good woman. I knew her kindness of heart. Ellen Lyle � that grand old Christian, who gave of self and possession to church, school, and other activities for the betterment of humanity. . . . All given in true Christian spirit; Miss Harriet Lyle - she was a worthy daughter of Mrs. Ellen Lyle. Need more be said of her? R. M. May and wife�good old pioneer Christians . . . most highly respected; Angelina May�later, Mrs. Dr. J. R. Sites. She and her husband were especially active in the final organization of this church, in the year 1891. They gave most liberally of time and money toward the building of our first church house on present church grounds. Dr. Sites made a late start in Christian life, but made the few years left to him count for much. It is firmly my belief that he got rather well caught-up with the job; Mrs. Sarah (Gilliam) Nichols�a pioneer of 1844. M. L. Robbins and wife�parents of esteemed member, John R. Robbins. They were faithful and substantial in membership - giving freely of means in support of the activities of the church - faith- ful to the end of their lives; Miss Catherine Robbins - A good Christian, and the very soul of kindness; Miss Gertrude Shulz � later, Mrs. F. M. Sebring of Roseburg. Not only the last on list of charter members, but last surviving; having passed away only a few weeks since, after a faithful Christian life of a trifle more than seventy-five years. Editor's note: Eugene Hayter is buried beside his wife Eva in the Embree Cemetery, east of Dallas. Dallas was first named Cynthian by Mrs. Thomas J. (Polly) Lovelady, a charter member of the Christian Church. Her home town was Cynthiana, Kentucky. An alternate view is that it was named in honor of Cynthia Ann Applegate, wife of Jesse. They lived briefly at nearby Salt Creek. Later, as the town developed south of LaCreole Creek, it was named after the Vice-President during the Presidency of James K. Polk - George Mifflin Dallas. It is very appropriate to select that name for the County Seat of Polk County! Historians agree on 1856 as the beginning year for the Dallas First Christian Church. Pioneer leaders in those earliest years included Glen Owen Burnett of Bethel and H. M. (Mac) Waller of Eola. In 1863, Waller and George W. Richardson organized the disciples into a formal group with 20 members. For 15 years the church met in the Baptist Church building. Other early leaders were Thomas Franklin Campbell, David Truman Stanley and Peter Rogers Burnett. Little information exists about the period from 1878 to 1891. J. J. Moss was living there in 1878 because some of his correspondence about the Mormon Movement and Sidney Rigdon has come to light. Benjamin Franklin Bonnell held a 20 day preaching meeting in 1891, pulling back together the strayed. Lots were purchased, and a building was completed and dedicated in that year. The sermon was by F. M. Rains who came from Topeka, Kansas by rail. D. M. Doty, a dentist, "filled the pulpit" and the church entered a time of steady growth. Eli Fisher was preaching at Dallas in 1893 and left for Medford during 1895. Among those ordained at this congregation were Archie Word, Gilbert Cays and Truman Robbins. The congregation is aligned with the Disciples of Christ. Pioneer Reminder: Lyle Street, Lyle School. This 30 x 50 building seated 200.
in 1924 after collapsing from a snow load. The once thriving community of Eola, to the west of present Salem, was incorporated in 1856. The name has been preserved in a street name, a county park and by several businesses in the area. It was once a steamboat stop and had a post office, a tan yard, a blacksmith, grist mill, a sawmill and, of course, a church. Hugh McL. Waller (1817-1893) came to Oregon in the wagon train of 1845, along with other gospel preachers. He established a church at Eola in 1863 and built a building. For many years, Waller was active in gospel preaching in the entire Willamette Valley. His name shows up being present at camp meetings and other activities among the churches. Waller, from Pittsfield, Pike County, Illinois, had been successful in preaching in Illinois and Missouri. One writer says "he converted thousands." When asked how he explained such results, Waller said, "Because the contrast between the Bible plea and the sectarian pleas was so great that it seemed a new light shining in dark places." Mac Waller has a message for this generation of preachers who prefer to look and sound like sectarians preachers. However, his health had broken and he was sickly at the time he left for Oregon. He was carried in a chair to the pulpit for his final sermon at Pittsfield. He came with his mother and younger brother, G.T., and other Christians from his area. As he traveled, he regained his strength. Mac Waller married Mary Davidson after coming west. She was the daughter of Hezekiah and Melissa Davidson of Polk County. He was from Illinois. Timid and retiring by nature on ordinary occasions, when he stood before an audience and exhorted sinners to repent, his timidity fled and he was a veritable giant. It was said of him that he made more converts than any other preacher this country ever had. H.M. Waller's sister Emily of Bethel, Illinois, married Harrison Brunk. They lived in Missouri just prior to making the trip overland in 1849. They freed their slaves, packed their possessions into two prairie schooners and came west. There were four yoke of oxen to pull each covered wagon. The trip took nearly seven months and was completed via the Barlow Road. They took a Donation Land Claim northwest of Rickreall, then in 1856 moved to the site of "Brunk's Corner." Harrison and Emily lived in a log house at first and had the "Brunk House" completed in 1861. The house, listed in the National Register of Historic Sites, was constructed by a neighbor and cost $844, its elaborate Story and Clark Organ cost $34.35. The church met in their living room at times rather than at the church building. The Brunk House is on Highway 22, 6 miles west of the Willamette River in Salem, just east of the Oak Knoll Golf Course. It provides insight into day-to-day living of the past. The Brunks were active members of the Eola Christian Church where Emily's brother preached for many years. Additional information can be gleaned from Historically Speaking, Volume IV, published by the Polk County Historical Society, Monmouth, Oregon in 1980. The Society also operates the Brunk House. 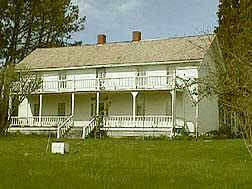 Pioneer Reminder: Brunk House on Highway 22 and Waller Street in Salem. Nestled away from main traffic routes was the village of South Yamhill, complete with its own postoffice. It was located just off of SW Broadmead on Kroeng. Later, the Broadmead postoffice was located two blocks away and the Lawn Arbor postoffice was less than a mile distant. These operated different years. The general location is three miles southwest of Amity, but inside of Polk County. 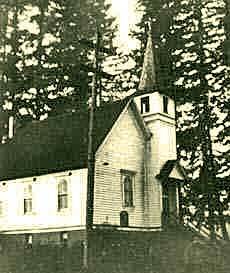 Dr. Swander reports a congregation at South Yamhill in 1858, but didn't know where the town was located. When the church closed, the closest congregation would have been Perrydale, two miles to the south. The neat little building of the Perrydale Christian Church still stands, wrapped into the larger building of another congregation using the property. 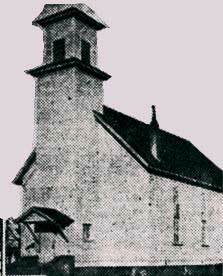 The church was launched in 1866. Early members included overland pioneers A.J. Wise and Ebinezer (1851) and Amanda Keyt who operated a mercantile store, the largest in town. They also launched a weekly newspaper, the Perrydale Patriot. Other early members included D.L. Keyt, the McGrew family and Enoch and Jane Richardson. Members of the Keyt family still attend the nearby Amity Church. Peter R. Burnett was the preacher in 1889. Also originating at Perrydale was song-writer and musician Will Caldwell. He moved to Dallas in 1898, where he completed a long career as a music teacher at Dallas College as well as organist and choir director at the Dallas Christian Church. Will was honored by the Dallas Christian Church in their 1947 yearbook. He is buried at the Bethel Cemetery near other family members. From the Spanish meaning good view, Buena Vista developed around 1847. The Buena Vista Ferry began service four years later. In 1871 a congregation reported from there having 23 members. 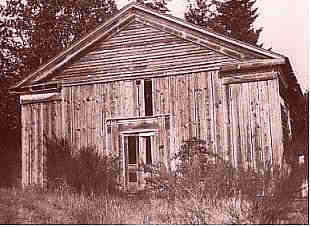 The group met in the one-room log school house at first, but eventually built its own building. Etty Minton Blaney supplied a photo of the old building and remembers seeing it before it was burned. By the time this excellent color photo was taken, the bell tower had been removed (they often leaked) and the windows had been replaced. Her grandfather, John G. Minton, found the building in disuse in the early 1920s and began preaching there and reported about 90 baptisms in the river during that period. Pioneer Christians with property adjacent to Buena Vista included John Bird Bounds (1846), Alexander Vance McCarty and Jane Bounds McCarty (1847), Edward W. and Amanda Bounds McCarty (1847), Hezekiah and Melissa Davidson, and Medders and Margaret Linville Vanderpool (1846). Medders and Margaret are buried at the Rock Hill Cemetery in Linn County. 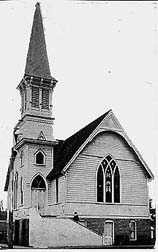 In an 1881 listing of congregations in Oregon, no mention is made of this church. The remote Buena Vista Cemetery seems to have been the cemetery of choice for many early Christian families living in the south part of Polk County. It is well maintained and located on a high hill overlooking the Willamette River - a beautiful location. The town is named for Independence, Missouri. The Christian Church dates back to 1875. Six years later it reported 43 members with I. M. Butler and W. C. Richardson as elders and Mac Waller as the circuit-riding preacher. Mac Waller discusses the founding of the Independence Church in his Reminincenses . -- The congregation at Independence contemplates building a new house of worship soon. The interest in the cause is growing finely there, and with a house of their own in which to meet, they will succeed. S. W. P. Richardson from Rockport, Missouri was the preacher in 1887. It was during his time with the church (which began before 1887) that the meeting house was constructed. The next year, Mr. Richardson moved on to Whitman County, Washington Territory. There is a local understanding that the building was first located at Third and D and later moved to Walnut and A. The earliest map showing the building located at Walnut and A is 1902. Sometime after that, the bell tower and 50 foot steeple were removed. It is now a private home. During 1889 D. M. Doty was preaching part-time at Independence. In 1891 R. L. Shelley settled here to preach. For more building photos, go to a separate page. The earliest record of a developing church in Falls City comes from the life of evangelist Silas William Patterson Richardson who settled here for a while in 1892. He soon moved on to Myrtle Creek, Oregon. Although meetings were held earlier in homes, the Christian Church reckons its beginning in 1894 under the leadership of Albert H. Dodd. There were 45 charter members and their first building was a mere 12 by 16 feet. It was built in one day, so was pegged as the "mushroom church." Soon another 16 feet was added. This was the day of the box-type wood burning stove and lamps hung on the walls. The Sanborn fire map of 1913 shows the building to be on the south side of South Main Street and just west of Lombard. Much credit, we feel, is due A. H. Dodd and wife who served so faithfully throughout the years before the congregation was able to employ a full-time pastor and wife. He was (had) a steadfast faith built upon the Rock Christ Jesus and his life was patterned as nearly as was humanly possible to that of the Master who he served. Under his leadership the Church had a steady forward growth. Baptisms were in a nearby mill pond with 17 being immersed at the startup time. Soon a larger building was built with volunteer labor and materials from the Luckiamute Lumber Company back in the hills. This new building, dubbed the "skyscraper church," was put into use in 1896, but not completed until 1900. Falls City - March 2. Brother Badger has just closed a four week's meeting with 48 additions; 35 baptisms. Never before has our plea for unity on the Bible alone been so well placed before the people here. - A. H. Dodd, Elder, Christian Church. There is a profile of Ephriam Badger.